Animated picture of an application of Baguazhang "Golden Pheasant Spreads Wings." This application is from the Jiang Rong Qiao system of Nei Jia kung fu, which includes Xingyiquan, Baguazhang and a version of Taijiquan. Baguazhang (Pa Kua Chang), or Eight Diagrams Palm, is one of the three main branches of Nei Jia Kung Fu or Chinese Internal Martial Arts. Baguazhang's history is likely the most obscure compared to its two siblings: Taijiquan and Xingyiquan. Baguazhang or Pa Kua Chang is also one of the less well known of all the major styles of Chinese martial arts. Baguazhang is characterized by circular movements, an emphasis on disruption, joint locking (with a relaxed "soft" structure), and throwing. Some Aikido stylists believe the creator of their martial art may have studied Baguazhang (and film of his movements - particularly footwork - would seem to support this conjecture). Baguazhang's beginnings are obscure as the I Ching itself. Legend surrounds the famous Dong Haiquan, and many practitioners often hold him up as the "father" of their art. However, circle walking was a part of many early Daoist meditative practices as well as external arts -- especially early forms of Eagle Claw Kung Fu. More importantly, while Baguazhang's beginnings may be obscure, the origins of the two main symbols of Bagua, Pre-Heaven and Post-Heaven, are ancient. They are mentioned in early texts such as, "The Yellow Emperor's Classic on Medicine," the "Dao De Qing," and the "Hua Hu Jing." 3. Connection with Wu Dong Mountain? 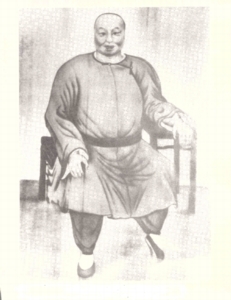 According to the late Pei Xi Rong, author and Nei Ji Kung Fu adept, it is most probable that Baguazhang, earlier than Dong Haiquan, has its roots on Wudang Mountain. Pei Xi Rong was one of five gate keepers and seal holders of "Jiulong Men" ("Nine Dragon Gate") Martial Arts from Wudang Mountain. Interestingly enough, this Nine Dragon Gate style , (or "Jiulong Men,") Baguazhang of Wudang Mountain has an uncanny resemblance to Li Zhiming's (or Liang Zhengpu) Lao Bazhang (or Old Eight Palms). One of the most fascinating aspects of the styles that emerged from Dong Haiquan's direct teaching is that no two are alike. In many instances, they are very different interpretations that look like completely different martial arts. This multifaceted development seems to have taken place because Dong taught each of his students based on a combination of their desires, what he thought their strengths were, and what he may have personally felt would serve them best. In turn, this lead to the plurality of what we see from the legacy of Dong's teachings. It obscures the art that Dong himself practiced. Not surprisingly, the developments Dong Haiquan made from those that proceeded him are a mystery. It is quite difficult to track the historical development between the different styles of Baguazhang from Dong Haiquan. For example, it has been said that one of Dong's students, Zhang Zhao Dong (Jiang Rong Qiao's teacher) learned from another student of Dong, Cheng Ting Hua at one point. However these teacher's styles emerged, Cheng Ting Hua's style and Jiang's style seem to lack any specific connection. Certainly there is little connection between these styles in the area of symmetry as they are practiced today. Jiang's Baguazhang is much more symmetric then Cheng's. 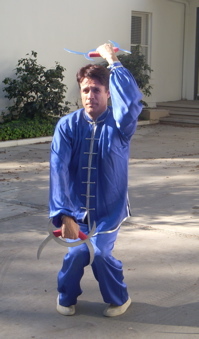 This schism can be found in a comparison of the palms and in weapons practice (including the sword, axe, and spear) and even in Jiang's approach to the two man practice. The practice of Ba Gua Zhang is clearly linked to some Daoist meditation practices involving walking in circles. It also seems to have some similarities with Eagle Claw kungfu. It was reported that Dong was familiar with advanced Sholin kungfu forms and that may have also influenced the martial art of Baguazhang. Another more profound influence is likely the Daoist martial art practices associated with Wudong mountain. These symbols are central to understanding Baguazhang as a martial art. The Pre Heaven generally presents a polar view that brings Heaven and Earth meet together on the horizon creating a continuous line and a broken line, thereby giving birth to Yin and Yang; Fire rises to Heaven while Water falls to Earth. (Sometimes Fire and Water are referred to as the Sun and the Moon respectively.) Thunder and sudden movement stirs the Winds of spring. Lake is concave in the Earth's crust while Mountain elevates from the Earth. The Post Heaven symbol, or Cyclical View places the basic eight symbols in a circle with their corresponding properties aligned with the seasons. Most significant to the Post-Heaven symbol is the replacement of Heaven in the Pre-Heaven with with Fire (Sun and Summer), and the replacement of Earth in the Pre-Heaven with Water (Moon and Winter). The Pre-Heaven Eight Trigrams were supposedly developed by the Emperor Fu Hsi around the year 2900 B.C. Legend has it that Fu Hsi received his inspiration as a gift from a flying dragon that came out of the Yellow River and flew up to the sky where the dragon then was observed changing his position throughout more mild and predictable seasonal changes. From these celestial observations, Fu Hsi made a connection to the rules he observed on earth. He observed the relationships between a starry night sky, changes on earth, with solar and lunar phases, and found a variety relationships and characteristics. Fu Hsi is credited with creating the polar view of Bagua, or Pre-Heaven symbol. He drew a harmonious relationship between the inhabitants of the Yellow River Valley, the cosmos, and 10,000 things or objects. As far as man's interaction with nature during this early civilization, lives lived according to the process represented by this symbol, would be mostly harmonious and peaceful. Many different versions of the I Ching, or Book of Changes, discuss Baguazhang's theoretical implications, fortune telling and the art of placement (or Feng Shui). In this context, Fu Hsi's early observations based on polarity are still used to interpret aspects of the oracle of Bagua. Around 2200 B.C. legend has it that the moderate climate of Fu Hsi's world began to change and flooding was more prevalent along the banks of the Yellow River. Also at this time, a new symbol emerged that offered answers and explanations concerning the changes that were happening. The Emperor Yu claimed he could predict the climate and by doing so, advise his subjects how to better utilize the turbulent changes along the Yellow River. The knowledge and magic afforded him by this new symbol helped the Emperor Yu supposedly predict occurrences in the future, and better utilize the talents of his leadership to support and develop a more advanced society. This fresh symbol revealed a magical numbering system arranged on the back of a tortoise (later known as a Magic Tortoise). A system which became a grid to efficiently organize and calculate a society that adjusted and benefited from the cyclical observance of the seasons instead of fearing them and their "turbulent" changes. This new symbol derived from the back of the "Magic Tortoise" became known as the Post-Heaven symbol of Bagua.